Some of you will remember 30 years ago playing with and learning from the BBC Microcomputers in schools and at home. They played an important role in making computing accessible and making a generation aware of the possibilities. These devices gave children the opportunity to get computers to obey them in ways that went way beyond mere button pressing. BBC Basic and Logo were its two most user friendly languages and enabled children to write computer programs themselves. 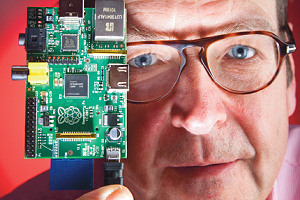 A few years ago Cambridge University noticed the decline in applications from students wanting to study computer science and devised a solution - let's get kids interested at an early age again, just like the BBC Micro did - hence the Raspberry Pi. A truly accessible, indeed naked, computer. £25 buys the machine itself although you'll need a power supply and other basics so budget £50 for the first one. What can you do with it and, more importantly, what can your children do with it? Your / their imagination will be the limiting factor. The Pi is a very powerful computer. It can run RiscOS (the BBC Micro's operating system), it can run Linux, it can run many programming languages, games, office applications. It can be used to drive light shows, robots, video streaming, home security. If you have children, as young as five or older, teenagers, you're a school governor or you want to set your own imagination free, Raspberry Pi may well be the key to the door. Let's not waste another generation.